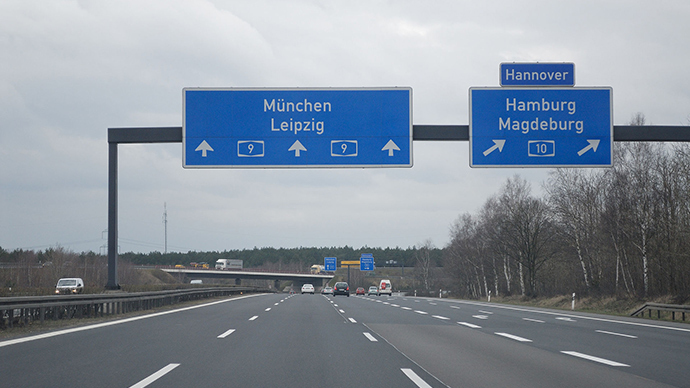 The German government wants to convert part of the A9 Autobahn in Bavaria into a test-field for advanced car technology. The project is key to ensuring the country’s ‘digital sovereignty,’ according to its transport minister. The track, part of the “Digitales Testfeld Autobahn” project, would be launched this year, Alexander Dobrindt said on Monday inan interviewwith the Frankfurter Allgemeine Zeitung newspaper. The plan involves equipping the road with infrastructure to allow cars to communicate with each other and the road’s own sensors to provide necessary data on traffic. "Cars with assisted driving and later fully-automated cars will be able to drive there," Dobrindt said. Germany, a major European car producer, wants to have robotic car technology that’s not dependent on foreign companies, the minister said. Domestic producers “won't rely on Google” he stressed. "We have to arm ourselves against a monopolization of data... create a digital sovereignty independent of America and Asia," Dobrindt said. Automated systems for driving cars rely primarily on technologies of collecting, communicating and interpreting data. The German government wants to safeguard the market shares of companies like BMW and Volkswagen by ensuring that they would have an edge with the emerging technology. Audi’s self-driving cars were showcased at the latest Consumer Electronics Show in Las Vegas. The producer’s RS7 model set a self-driving speed record in October by completing a lap of the Grand Prix track in Frankfurt in just over two minutes, reaching speeds of up to 240 km/h.